The world’s first self-heating massage tool! A Spa Style Massage which won’t hurt your pocket! 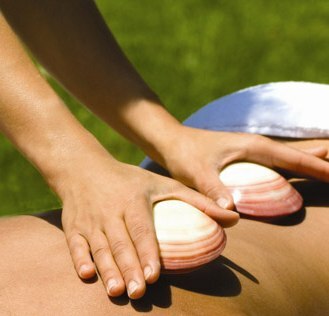 Hot Lava Shells give an intensive deep tissue massage with a firm pressure and to treat deep rooted muscle problems. The radiating heat from the shells releases tension and leaves you feeling instantly stress free and rejuvenated. Heat used on problem areas releases muscle tension and soreness, promoting relaxation of the fascia layers that connect muscles to the rest of the body. The heat and massage combination further encourages removal of toxins from cells, enhances blood flow and can help relieve painful joints. Hot Lava Shell Massage, combined with an aromatherapy blend of oils to moisturise the skin, gives a deep yet comforting massage to aches and pains, stress and tension. The warming energy of the shells helps to revitalise and rebalance the body and mind. The smooth shells glide over the body with varying pressures, techniques and precision by Hayley tailored to meet your particular needs. As well as adding a wonderful dimension to any body massage, some clients find the shells are really helpful on the abdominal area to improve core stability and strength, alleviating minor back ache and relaxing the abdominal area. Ideal for anyone suffering from IBS and can help to improve the functioning of the digestive system. The combination of soothing heat and gentle massage stimulates the body’s natural systems to effectively eliminate toxins and reduce bloating. Helps you feel rejuvenated and flatter in the tummy area. These beautiful Tiger Clam Shells are an eco-friendly, natural food by-product from the Philippines. They are non-porous, meaning oil residue or bacteria cannot settle on the surface. Composed of calcium carbonate, the Lava Shells give off calcium ions when heated which are then transferred directly to the skin during the massage process helping to regulate the skins natural renewal process and give firmer healthier looking skin. The Lava Shell sachets which create the heat contain biodegradable, natural, non-toxic ingredients: black lava, iron, magnesium, sea kelp and sea algae, salt water and lavender. These simple, all natural ingredients create no harmful by-products and are environmentally friendly. Hotel Spas will often charge £70 – 90 for a 50 minute Lava Shell Massage, but with Hayley you simply pay £5 per shell in addition to the cost of an aromatherapy holistic massage. One shell is adequate for a full hour’s therapy as it stays hot for well over an hour and this would cost just £45.